When I walked into the Emergency Room to visit Larry that next day, the nursing staff all zeroed in on me and took me aside before I could see him. When I was being led to a “quiet room,” my heart sank. The palliative care doctor and his intern were called and almost immediately appeared. He sat down across from me. With those nine words, life for me came to a standstill. Thankfully I had already arranged and paid for Larry’s cremation, made basic arrangements for the memorial and had the power of attorney and “Do Not Resuscitate” (DNR) order with me. I handed the doctor the paperwork and promptly melted down. I wanted nothing more than to spend as much time with Larry as I could, because we now had a countdown clock. 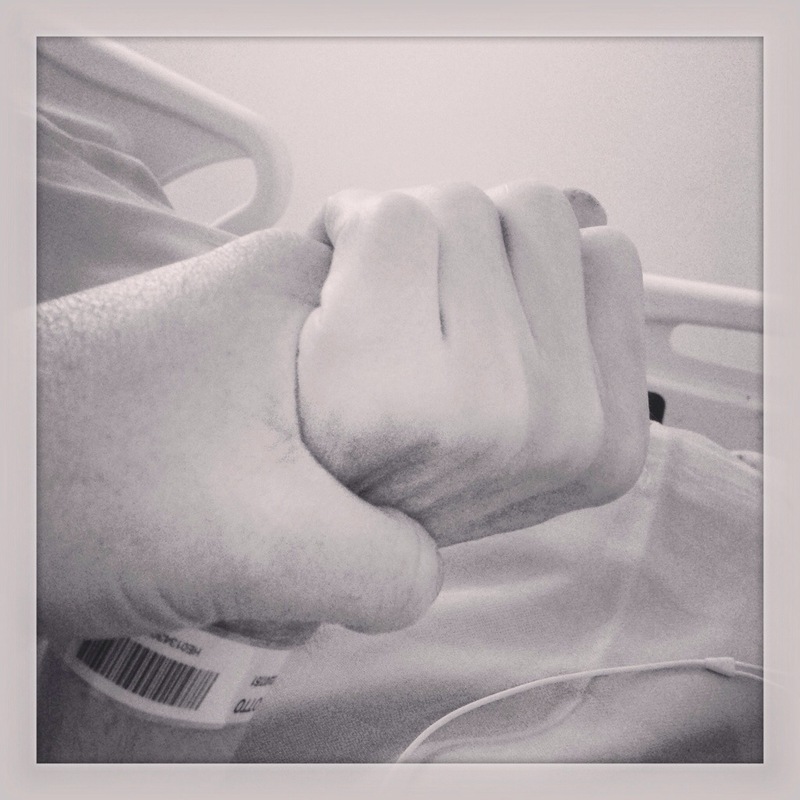 And together we wept and held each other until visiting hours were over, tucked away in the ER bay with curtains around us, nurses checking in on us but giving us what little time we had left together. Since Larry’s birthday, things had been getting worse for him and the home care nurse had been visiting regularly and I’d been trying my best in focusing at work. It was clear that we were nearing endgame. Larry’s kidneys were gone, he was in acute liver failure and the treatment was becoming less and less effective. Rev. Moore had visited several times as had my family and friends. I don’t know what was harder to watch, my husband failing and fading away or witnessing the reactions of our loved ones realizing that this was IT. This was the big one. On July 29, 2013 the lactulose stopped working altogether and Larry was entering acute liver failure. He was unable to walk, unable to answer simple questions and all sense of “him” was slipping away. I called Avi, the palliative care nurse, to ask what to do and was told that I could either call 911 myself or wait 45 minutes and he could. I was in tears and unable to speak but somehow conveyed “yes,” Joe confirmed he would send the paramedics, however the fire department would most likely arrive first. They retreated immediately and went to get their hazmat gear while the paramedics arrived. I explained the situation and suggested they get the chair as Larry was no longer able to walk, let alone handle stairs and the stretcher would not work. They did so and as Sunny, Chloe and I quietly watched in shock, they escorted my husband from our home for the past 13 years for the final time. I was beyond tears at this point and just frightened and confused. 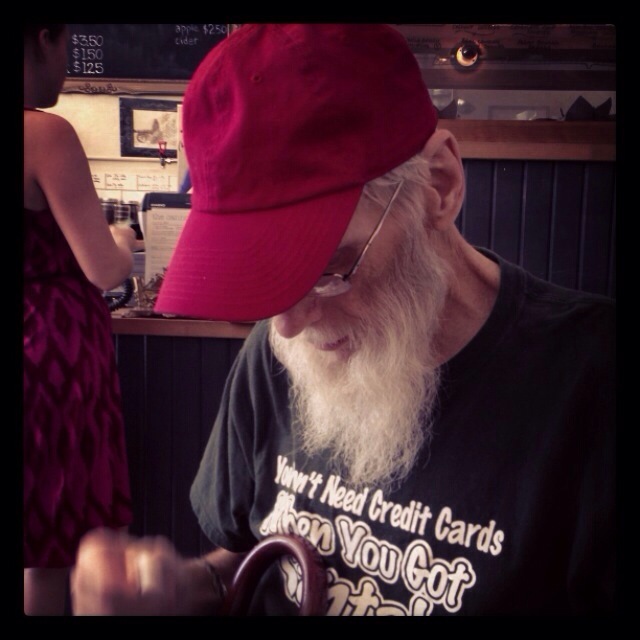 The paramedics confirmed that they were taking Larry to Juravinski for cancer care consideration, we had hoped that we may eke out a few more weeks or months in hospice with the right treatment at that point still. Incredible neighbours Michele and Jeff didn’t hesitate and drove me up to the hospital behind the ambulance. Where I spent a sleepless night by my husband’s side in the ER until they sent me home at Larry’s insistence, exhausted. One year ago this date, Larry and I embarked on our last public “date” as a couple. Due to his rapid decline in health and mobility, the palliative care team from the Community Care Access Center (CCAC) had been engaged and he was getting regular visits from the nurse and support worker while I was able to maintain a (somewhat) normal schedule at work. By this time, his kidneys had completely failed and his legs were swollen with edema to the point he couldn’t walk. Courtesy of Rev. Moore (thanks Doug!) at Laidlaw Memorial United Church, we had borrowed a wheelchair and we were able to get around town using the bus, patience and brute strength on my part. He was also starting the earliest phase of end stage liver failure, which starts to show as periods of fatigue and confusion as the body drowns in the toxins the liver no longer clears from the blood stream (hepatic encephalopathy) and we had started the only treatment for this condition – a strong laxitive called lactulose. Larry didn’t feel like going out often as he was getting weaker as the cancer consumed his body, his strength and his will, but he wanted to go out for his birthday. He was not able to tolerate most solid foods and we had him on a very soft diet including Ensure shakes to keep him in protein and calories. However it was his birthday and he wanted a treat (despite how crummy we both felt) and to also get him out of the house. When asked where he wanted to go he answered with one word: Cannon. We got him out of bed and down the stairs (by this time, he was so weak that we needed to put a chair on the landing for him to rest 10-15 minutes prior to taking the next series of steps. Getting him from the bedroom to the wheelchair at the bottom of our front porch steps was now a process that took nearly 45 minutes and a heck of a lot of patience on my part. Going out with someone who was in kidney failure and end stage liver failure meant that one also had to have a change of clothes or two, so taking Larry out was no mean feat. I would then tuck him in and cover him up with the polar fleece blanket and slowly walk him the three blocks to Cannon street, where we waited for the bus. We got off at Ottawa St. and took him to the back entrance of the Cannon Coffee Company where I could get him in unemcumbered by the step at the main entrance. What would have normally been a 20 minute walk from our house to the Cannon, was a nearly two hour ordeal. We were able to tuck Larry and his wheelchair into one of our regular tables and I placed our order, he napped while we waited for our food and coffee order, while I read. I was getting exhausted as well as the Lactulose usually meant a washroom trip and I didn’t know how I’d manage at the Cannon, should he have a call of nature. I requested our coffees in “to go” cups and my food in a take out container, just in case, Larry just wanted a muffin top. When his food arrived, I woke him up and picked at the muffin top and had a few sips of coffee. At this time, I could see what little colour he had in his face draining, so I packed our stuff away and got ourselves to the bus stop to head home. Larry dozed the entire way. So 2 hours to get to the Cannon, 1 hour to get back home, 30 minutes to get Larry upstairs and tucked into bed with the help of a neighbour and the homecare nurse, just so we could have a 15 minute chance at a normal life at Larry’s favourite cafe on his birthday. I’d do it all over again. In an instant. Happy birthday Larry. I’ll have a coffee for you at the Cannon tonight! As if dealing with my husband’s terminal illness wasn’t enough, another area of my life was going to hell in a handbasket. People whom I thought were firmly in my past after a recent switch in geographical locations continued to stir up trouble in my life to the extent that I was seriously considering a change in occupation. Two days after finding out my husband was dying, I was being punished for being forthright and honest about my experiences and feelings in this blog while attempting to secure emotional catharsis in a healthy manner. You see, part of the reason I do this blog is at the behest of my councilor who understands that I tend to “bottle” and internalize my feelings. By writing this blog, I am able to express my emotions in a way that is as healthy as any. It also helps my friends and family understand the complexities of what’s rattling around in my noggin. I was being told that I had no right to feel the way I felt and could not express those feelings publicly. After much ado, I edited the offending entry under protest and posted the section of the Canadian Charter of Rights and Freedoms on the freedom of expression here on this blog. What I learned about this episode is that while I had let things go and moved on, other people are not able to do so. I also learned not to be so precious about keeping “friends” or contacts on social media and have since started editing my contact lists. While I grieve the loss of many of these contacts, if they cannot accept that I have the right to my own opinions or feel what I am feeling, they clearly do not respect me as an individual or as a friend. I also learned to let go of past insults, slights, perceived or otherwise, grudges and people whom have harmed me in the past. I will leave those individuals exactly where they need to be left: in my past. And believe me, I’ve agonized over deleting certain people from my social media streams and, yes, my life. I miss them and am saddened by the fact that I had to do so. However last July and August and the ensuing year have taught me one important lesson: life is too short to be spending it arguing with people who don’t accept you for who you are. If people want you to change who you are to suit their needs or cannot accept that you are growing and changing as you experience life, then they are not looking out for what’s best for you. At the same time, I tried to shelter Larry from these shenanigans, however I was an emotional wreck due to these stressors. I also resolved that I would no longer allow myself to be defined by my vocation and began to assert the importance in the division from my working life and home life. I refused to bring what happened in the day time hours home and spend my evenings and weekends focusing on what little time I had left with my husband. I still carry this lesson with me and continue to live this philosophy – letting go of the people and events that would have weighed me down in the past. In letting go, I’m able to move on. In letting go, I’m a happier and healthier person. Larry and I were initially given six to twelve months, we got twenty-six days, ten of which he was in the hospital, leaving me with sixteen days with my husband. Not much time at all. Especially when his health was failing and his body was letting him down as the days passed. – discussing memorial service and handling death and crossing over with Christian and Wiccan clergy. – reaching out to his family. At the same time we began to recognize that six to twelve months seemed to be a very, shall we say, optimistic assessment at how much time we had left. Particularly when we got the CT scan results and the words “riddled” (tumours) “rampant” (cancer) and “obliterated” (his liver) were used in it. – walking the dogs while he still had strength. – sitting on the front porch when he didn’t have strength, even when in 90 degree weather, he was bundled in sweaters and under a polar fleece blanket. – attending Cannon Coffee Co. for coffee, waffle bacon and eventually just to sit and enjoy the ambiance, love and hugs. Even when I had to push him in a wheelchair into the cafe. – just being together and realizing that our time was limited and rapidly diminishing as each day went on, so we maximized what time we had together. It wasn’t fun, watching my husband go from being a vibrant, jolly and strong man with a twinkle in his eye to a skeletal, pale and frail man in the manner of days. This is how virulent the cancer was. He was 165 lbs on the day of the CT Scan and 122 lbs when he was admitted into the hospital – SIXTEEN DAYS LATER. He went from walking slowly to being wheelchair bound to bedridden during this time frame. We had incredible service from the local CCAC and the palliative care team. The visits from the nurse, Avi, were a pleasure, despite the reason behind his being there. Rev. Doug Moore from Laidlaw Memorial Church was a pleasure to talk to both as spiritual care and as a friend. During this time, I also found out who our real friends were and not just fairweather acquaintances. While I understand being around somebody who is dying is difficult, both Larry and I welcomed any distraction and friendship. I also had some unexpected and unpleasant surprises at work which I won’t get into here, however my manager and assistant director at the time were very supportive of me both personally and professionally and I’d like to hope the cause of these surprises is far distant in my rear view mirror as of now. And at some point, Larry also secreted little messages to me throughout the house. I can’t imagine when he found the time, energy and spirit to do so, however I kept on finding mementos, cards and slips of paper which was his way of showing me he loved me and reminding me to live after he was taken from me. His love and kindness lives on in my heart. So we packed a LOT of living and life experiences in those final 16 days we had together as a couple and I cherish and honour the memory of them. A year ago today, Larry and I sat in an examination room at Princess Margaret Hospital, awaiting the oncologist who had been treating him for the past year. He had survived liver cancer, a transplant, the diagnosis of pancreatic cancer, a Whipple procedure (a surgery where part of the liver, stomach, pancreas and intestine is removed) and several months of chemotherapy. In April, he had received the news: tumour free. We were back after his monthly follow up CT scan to get the results. When the oncologist walks into the examination room in tears, one suspects things are not good. “We gave it our best shot…” was how he began, his voice trailing off. Larry asked if he’d start chemotherapy or radiation, the oncologist said that any treatments would kill him just as quickly as the cancer inside him was. Six to twelve months was the time line given to us. We left the office shell-shocked, silent, in tears. We made it to the elevators where I vomited into a garbage can. Which is a feat unto itself as I don’t have the physiology to puke. We sat, trying to figure out our next steps. I did what any confused and frightened kid would do and called my Mom. Somehow in between my hysterics I was able to pass on the news as Larry sat in stony silence. Somehow we made it home that afternoon. We sat in silence on the go train, just holding hands and my head on his shoulder. I called in sick the next day, trying to assess what to do next. We contacted our family doctor and made an appointment to discuss the next steps and palliative care. Thus began our final weeks together. Over the years I have known you, you have always been quite forthcoming in how unhappy you are in the City of Hamilton. You constantly lament the lack of opportunity when people are moving here by the thousands. You whinge about having nothing to do on a weekend where there were two downtown street festivals, a paid beer and music festival and a free world music and culture festival. Not to mention the myriad of regular weekend activities available to you in any metropolis, plus hiking, biking trails, many art galleries, an internationally renowned botanical garden and some generally cool people. The surest way to have entropy in your life is to sit back and wait for something to happen. But dear friend, your broken record laments about how awful things are here are threadbare and worn. Either do something to make this city a better place for you or move as you so often promise. I suspect if and when you move, you will find yourself equally as restless there as you are here. Let me know if that changes and you have finally found what makes you content – I will be truly happy for you! Until then, I don’t need your negativity in my life and in my enjoyment of the city I call home. Yes it isn’t perfect, yes there are tons of things that frustrate me. But I am actually doing something towards alleviating those.